We eat a lot of boneless, skinless chicken breasts in this house, so when I started on my mini-quest to create some real food recipes for my Instant Pot, creating delicious, whole ingredient Instant Pot chicken breast recipes was a top priority. 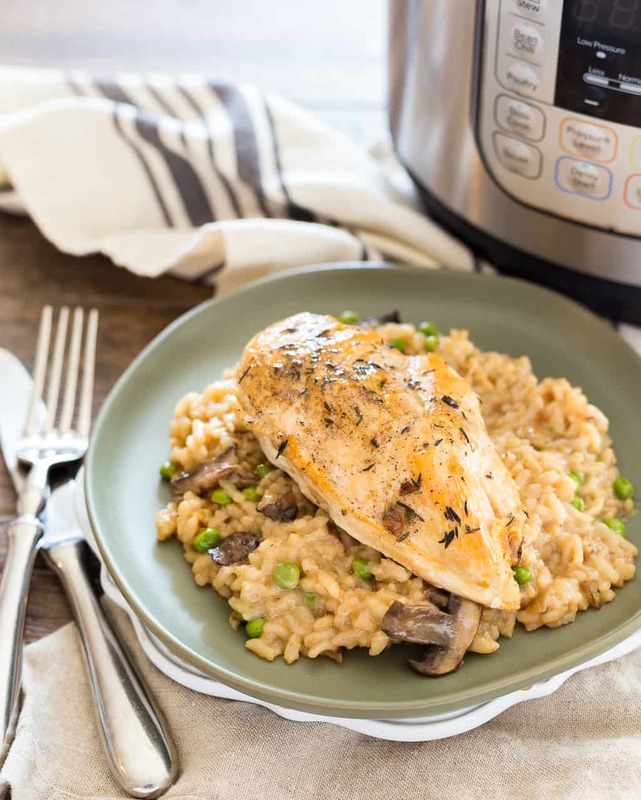 This Instant Pot chicken breast and risotto with peas and mushrooms has become a new favorite. 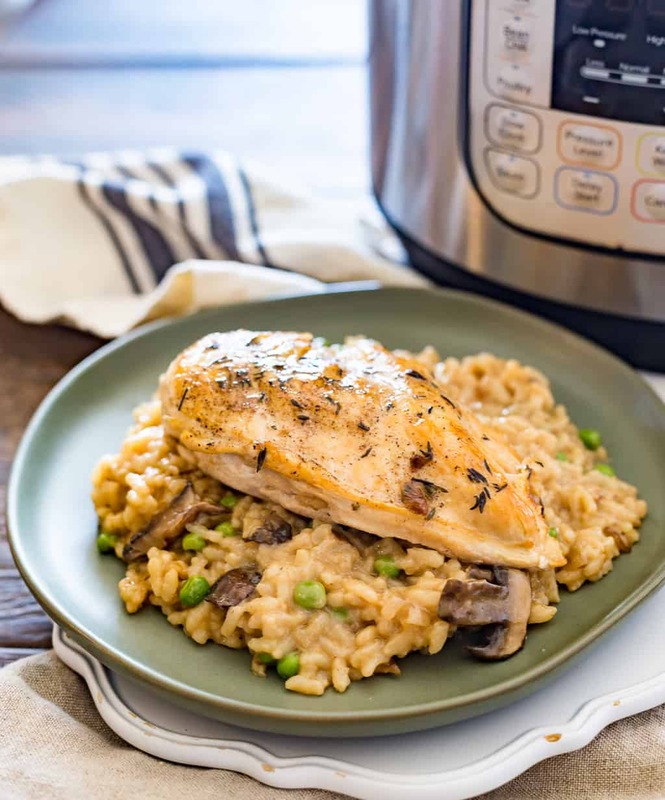 I just love that the entire meal is made in the Instant Pot, so at the end of cooking, all I have to do is throw the plate the chicken rests on before being added back to the pot into the dishwasher, clean the Instant Pot itself, and nothing else! 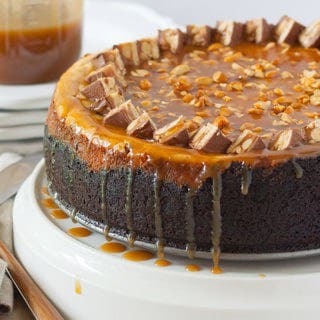 Speaking of love, between the easy cleanup and semi-fancy style of this meal, I think this would be an excellent Valentine’s Day dinner. Just sayin’. If you want to get extra fancy, some shaved parmesan on top would really take this over the edge. What type of rice can be used for risotto? 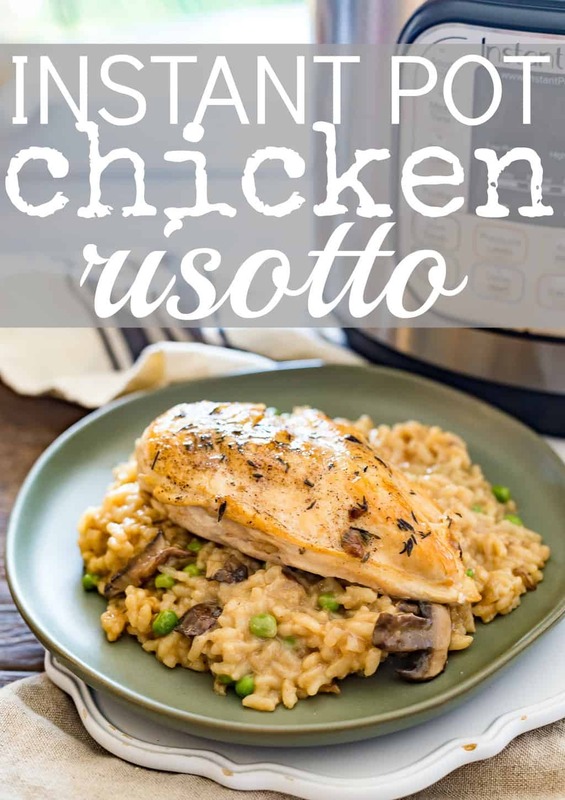 When we are talking about rice recipes, particularly pressure cooker / Instant Pot rice recipes, it is really really really important to use the correct variety, which in this case, is Arborio rice. 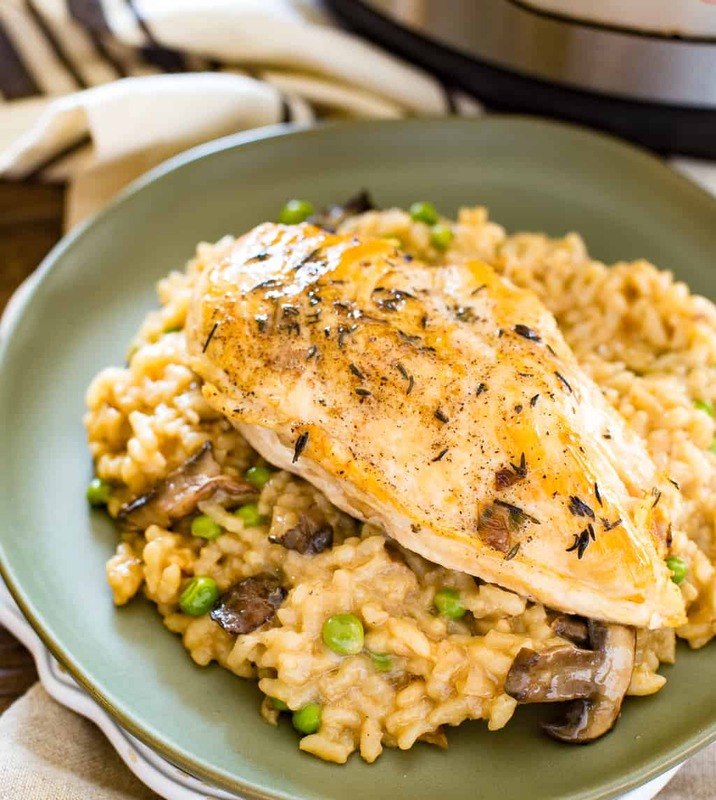 Each type of rice will hold up differently under pressure, require different amounts of liquid, and produce an outcome that is specific to its grain and processing, so for this recipe to turn out, make sure you stick with the Arborio. If you’d like to learn a little more about how cooking styles vary with rice, check out my post on How to Make Carolina Gold Rice to learn how rice was made “way back when” in the Carolinas! I guarantee you’ve never made rice like that before! Now that you know you’ve GOT to get the right rice for risotto ( Arborio ), you’re ready to cook! 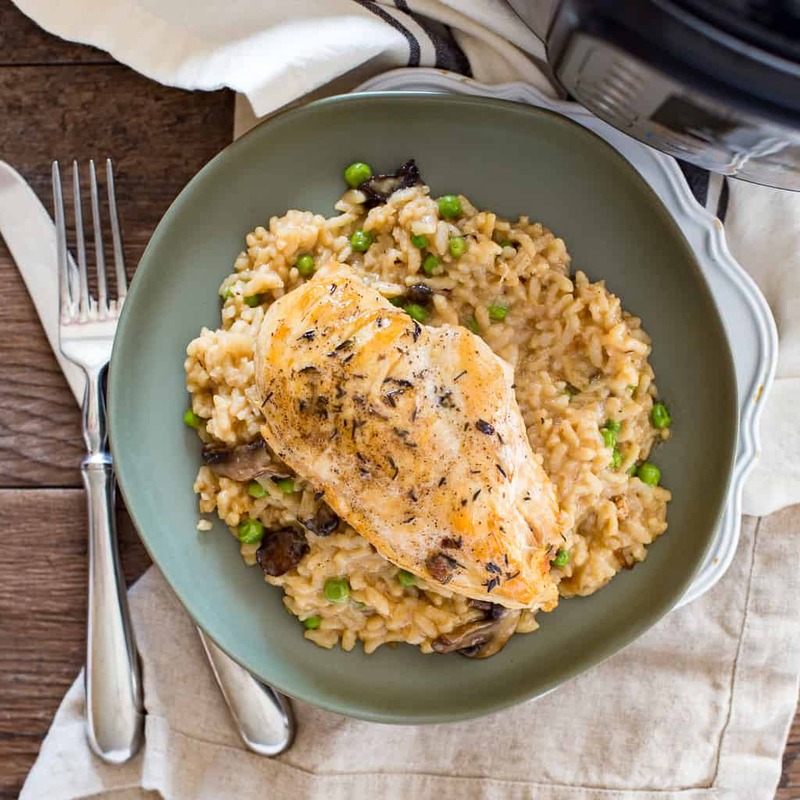 Instant Pot Chicken Risotto is a flavorful, easy Instant Pot dinner recipe of creamy risotto, mushrooms and peas, and perfectly cooked boneless, skinless chicken breasts. Remove the lid from the Instant Pot, press "Sauté", and set the timer for 15 minutes to give you enough time to sauté everything. Once the display reads "HOT", add the 3 Tablespoons of olive oil to the pot. Give the oil about a minute to heat up. While the oil is heating up in the pot, season the boneless, skinless chicken breasts with the salt, pepper, and thyme. Making sure the entire bottom of the hot pot has a thin layer of oil coating it, place the seasoned chicken breasts into the pot top-side down. Cook for four minutes, then carefully remove each breast and set it aside on a plate for now. Add the butter, onion, and mushrooms to the pot, using a wooden or metal spoon to scrape up any bits the chicken left behind and to coat the onion and mushrooms in the fat as they cook. Cook for 4 minutes, stirring occasionally. Add the garlic and rice, and cook while stirring for 1 minute. Add the wine to the pot, and stir everything to loosen any bits stuck to the bottom. Cook the wine with the mushrooms, onions, garlic, and rice for about 1 minute, and then add the chicken stock to the pot and stir to combine everything. Press the cancel button to stop the Sauté function. Set the chicken on top of the rice ( do NOT push it down into the pan ), lock the lid onto the pot and close the steam valve ( set it to sealing ). Press the Manual or Pressure Cook button and set the timer for 5 minutes. Once the pot has come up to pressure and then cooked for 5 minutes, the pot will move to "Keep Warm" on its own and the timer will begin counting back up. After 5 minutes of Natural Pressure Release ( i.e. 5 minutes of the timer counting up ), carefully open the steam valve to quickly release the rest of the pressure. Remove the lid, remove the chicken breasts from the pot and set aside on a clean plate. Stir the frozen peas and the parmesan into the risotto in the pot, and then place the lid back on and let the pot sit for 3 minutes. After 3 minutes are up, stir and serve! 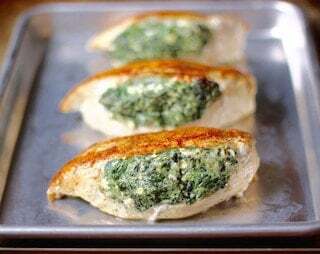 Before you add the chicken breasts, make sure that there is a thin coating of oil on the bottom of the pot insert to ensure that they do not stick!